It's about that time again. Time to get the Vessel up and running. Check out our full selection of Zinc products online or in store. 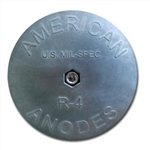 All shaft zincs have a copper contact on each half for a permanent electrical connection. Models X-1 through X-5 have two stainless steel allen screws. Models X-5A and larger have four sets of screws. Stainless steel nuts are pressed in. Shaft Anodes made of Mil-Spec Zinc Alloy. Thse are the Best Choice for salt water vessels.